Our collective attention span seems to be getting shorter these days. We don't have time to hear every minute detail about a new application. We want to hear "just the facts." Tell us what's new, tell us what's better, and tell us how it's going to make our lives easier or more productive. That's what "Top 5" lists are all about. So, in that spirit, here are the top five latest and greatest new features and functions for the new Microsoft Word 2007 and PowerPoint 2007 apps. If you've ever had to convert a file to a PDF, you know how frustrating it can be if you don't have the conversion tool. I've been so desperate at times that I've paid online companies to do it for me. Not anymore. You have to download an add-on from Microsoft (go to Microsoft.com and search for "2007 Microsoft Office Add-in: Microsoft Save as PDF or XPS"). Once it's installed, you'll see this option every time you go to save your documents. You know what PDF is, but XPS certainly isn't as well known as a file type. It's the new XML Paper Specification that is an up-and-coming format for sharing documents. A document converted to XPS maintains its look and feel with no loss of quality. Your fonts, formatting and high-quality images still look the same. XPS is based on an open standard -- viewers are free for all to download and use. You can even open XPS documents with IE7. For more information about viewing and generating XPS files, go here. Your documents may contain metadata or other information you might consider private. You don't want to send this along when you need to e-mail your files to a colleague in another department, branch office or company. Items like comments, revisions, headers or footers may contain information you want to strip from a document before you send it. Finding all that hidden data can be time-consuming and confusing. The Document Inspector does it in just moments. Select the Office orb, then Prepare and then Inspect Document. You can select or de-select any of the options (see Figure 1), and then choose the Inspect button to give your file a run-through. Figure 1. 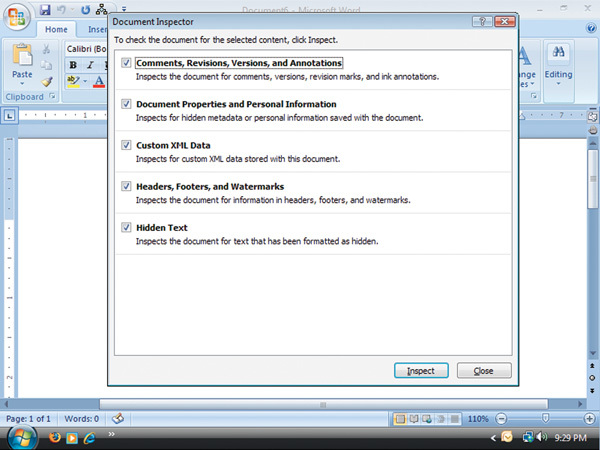 The Document Inspector strips your document clean of personal information before you share it with others. Personally, I'm not much of an "on-screen" reader. I prefer a good old-fashioned book or magazine in my hands. There are many, however, who spend hours reading documents on their screens. The new screen-reading display in Word 2007 is much improved from Word 2003 when it was called Reading Layout. Calibri, Cambria, Consolas, Candara, Corbel and Constantia. I remember the days of Word 6.0 macros. Ah, the good old days. Word 2007 gives us better days with the Building Block Organizer. Sometimes you don't want to create an entire document template. You just need a piece, like a header/footer arrangement or a cover page you can use over and over again. With Word 2007, you can create your own "blocks" to add to the Quick Parts Gallery, which is located on the Insert ribbon, under the Text grouping (it's listed as "Quick Parts"). You could also select from one of many pre-configured "blocks" to add preformatted content (see Figure 2). Figure 2. 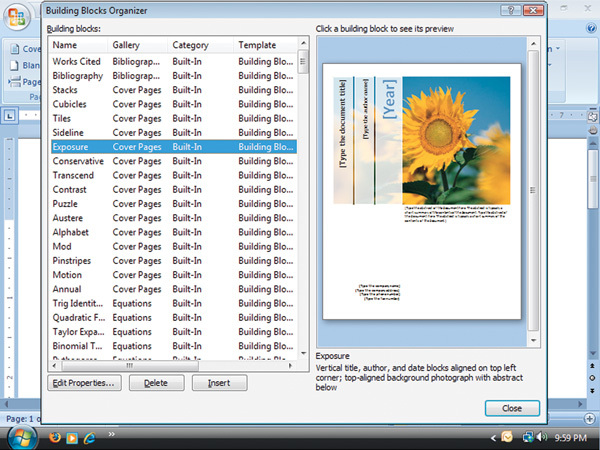 The Building Block Organizer gives you a quick way to add preformatted content. Habla Español? Ni keyi shuo Zhongwen ma? Do have any idea what I'm saying? No worries, because Word 2007 includes built-in translation tools. The Translate tool and the Translation ScreenTips tool are both located on the Review ribbon, under the Proofing group. These are excellent for those of us who work with documents in other languages from time to time. When you use the Translate tool, the Research pane will appear. A company called WorldLingo.com helps with the translation. Translation ScreenTips operate a bit differently. You select a language to which you want a word converted, hold your cursor over a word and it will bring up a definition for that word. The new ribbon interface -- we know many hate the change, but it's the future. It looks cool and it's easy to use once you get the hang of it. You use the Blog Editor for other purposes, so why not blogging, too? The Office 2007 suite has enhanced SmartArt. Themes traverse Office applications to give presentations a unified look. The Contextual spelling checker helps when you spell things correctly, but use words in the wrong context. Live Previews lets you see what something is going to look like before you make the final selection and have to use the Undo key if it doesn't work. Sometimes you'll end up with a PowerPoint slide so complicated and filled with so many objects that you can't see them all, especially if they're layered over one another. If revising the slide for greater simplicity isn't an option for whatever reason, there's another way to get the whole slide into view. The Selection Pane can help you see your objects by listing them all in a side panel. You can select them individually to make them appear. This pane isn't easy to find, however, so it might have gone unnoticed. It's located right on the Home ribbon in the Editing group. Click on the down arrow next to Select and choose Selection Pane. By selecting or deselecting the little "eye" next to a shape, you can make them appear or disappear. If you frequently use PowerPoint to give presentations to a large audience using additional AV equipment, you're going to love this feature. I had the chance to use this feature at Redmond magazine's last TechMentor Conference in Orlando when I was speaking on the subject of Windows Vista and Office 2007. Essentially, the Presenter View lets you display your PowerPoint slides on another monitor or onto a screen through a projector. While you're doing this, PowerPoint shows you -- the presenter -- a view of your notes, a preview of the current slide and upcoming slides in your slide deck. Rather than trying to memorize your presentation, or work from a side set of awkward notes, you can enlarge them so they're easy to see (see Figure 3). Figure 3. The Presenter View makes giving the presentation much more fun and easy to understand. You can also use the thumbnails to choose slides out of order if you need to customize your presentation on the fly. This is a great feature, because instead of clicking through five slides and saying, "You don't need this one, or that one," you can jump right to the slide you need to make your point. To turn on Presenter View, go to the Slide Show ribbon and look for the settings under the Monitors group. In previous versions of PowerPoint, you could always go into the Slide Master and make changes so your presentations conformed to a certain look without having to change each individual slide. You would just make changes to the Master Slide and the entire presentation would have a uniform look. 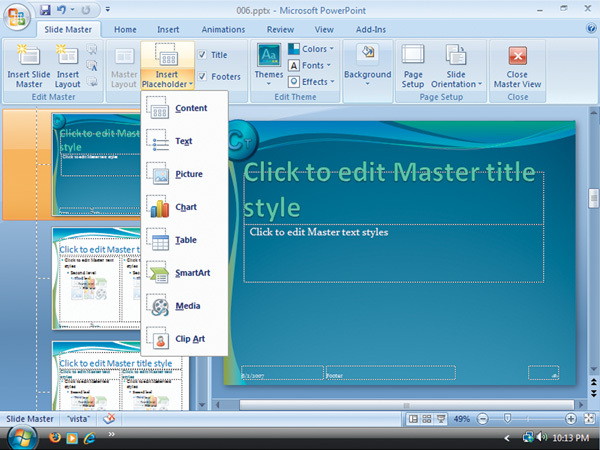 PowerPoint 2007 still uses a Slide Master, but it has a section of slide layouts beneath it as well. In other words, you have the primary slide format, and beneath that you have a title slide layout, title and content slide layout and so on. The individual layouts inherit formatting from the Slide Master. From there, you can make additional changes to each layout. 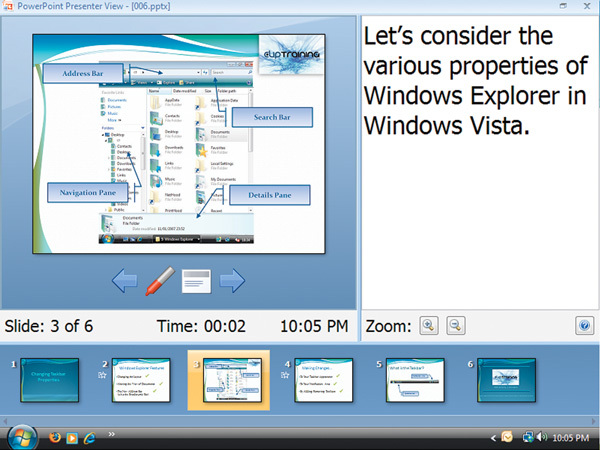 To see these layouts, go to the View ribbon, then the Presentation Views group and select Slide Master. Another change you might like (especially if you're really into PowerPoint) is the ability to change placeholders within Slide Masters. For PowerPoint novices, a placeholder is the message that comes up in your established section boxes that say things like "Click to Edit Text." It can also be a pre-determined spot for a chart, table or diagram. To change placeholders, you need to open the Slide Master. Then on the Slide Master ribbon, under the Master Layout group, select the down-arrow next to Insert Placeholder and you'll see your options (see Figure 4). Figure 4. Changing the Slide Master and adding placeholders gives you greater control over your presentations. You can say goodbye to MS Graph if you also have Excel 2007 on your system (which you most likely would with the Office 2007 suite). You can add a chart or graph to your presentation in one of two ways. If you embed and insert the chart into the presentation, you'll do the editing in an Excel 2007 worksheet. The worksheet file is saved with the PowerPoint file, so you won't need to keep track of two files. If you already have a chart in an Excel worksheet, you can paste the Excel chart into your presentation and it will link back to the Excel worksheet. The graphic improvements are outstanding, from effects like shadows, reflection, glow, soft edges, warp, bevel and 3-D rotation to shapes, SmartArt graphics, tables, text and WordArt. There are also picture styles, recoloring abilities and interesting photo edges. To see some of these features at work, just add a new slide to your presentation and choose the Picture with Caption layout for that slide. Add your picture by selecting the icon in the middle, then selecting the Design ribbon. The zoom slider makes zooming in and out much quicker and easier. Use Ctrl+G (or Ctrl+Shift+G) to group or ungroup selected items. You can save files as PDF or XPS, just like in Word. There are a couple of new autoshapes and font effects. PowerPoint also has the Inspect Document feature. You can select undo/redo even after you save your file. We'll cover the top five greatest new features and functions of Microsoft Excel 2007 and Outlook 2007 next month. If you have any favorite aspects of Word or PowerPoint that we didn't cover here, let us know at editor@redmondmag.com or leave a comment below.